The University of Northampton and Students' Union have kindly donated office space at the new Platform venue, equipped with first-aid equipment, for use by police officers and street pastors on Friday and Saturday nights. This provides a fit-for-purpose town centre building where people who may have found themselves in a vulnerable situation can be taken to ensure their safety, away from public view and in a relatively comfortable environment, until they can be appropriately looked after. The new Welfare and Safeguarding Hub will also provide a central location for officers patrolling the busy night-time economy, where they can do paperwork and conduct initial inquiries without having to return to a main police station. This will support and be in addition to the Force's weekly Nightsafe policing operation in the town centre, with the intention being to staff the office from 10pm on Fridays and Saturdays until 4am the following morning. Inspector Dave Rayfield from Northamptonshire Police said: “We're really grateful to the Students' Union and the University of Northampton for their contribution to this initiative. “The building is ideally placed to help to make the town centre a safer place on Friday and Saturday nights. We recognise that people coming into the town are at times in need of extra support and we believe this service will help to provide some of that support when people are identified to us. Rafael Garcia-Krailing, Students' Union President, said: “The Students' Union is committed to not only ensuring our students, members and customers can enjoy an outstanding experience in our own venues, but that everyone can enjoy a safe night out in Northampton's town centre, assured that, if they require additional support, there is an appropriate safe space for them. Becky Bradshaw, Head of Safety, Security & Environment at the University of Northampton, said: “The University is committed to not only ensuring our students and staff are able to enjoy a safe night out in Northampton's town centre, but also the community of Northampton. Cllr Anna King, Northampton Borough Council Cabinet member for community safety and engagement, said: “This new facility directly complements our ‘Out Tonight’ campaign which aims to get people to plan ahead. On a night out, it is so easy to perhaps have a drink too many, get separated from friends and have no clue how you are going to get home. 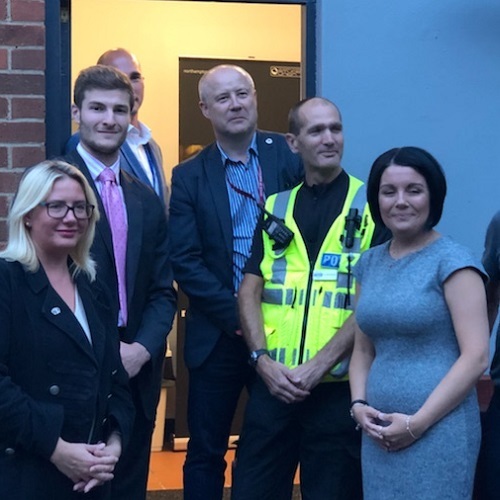 Stephen Mold, Northamptonshire Police and Crime Commissioner, said: “We want people to have fun and stay safe on a night out, but if someone is vulnerable, there is now a safe and convenient place where they can be taken to receive support. If you notice someone who appears vulnerable, tell someone such as a door supervisor, street pastor or police officer, or call police on 101 or 999 in an emergency.